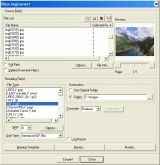 Tiff Pager can extract the pages you want from your tiff file, i.e. the first 10 ones or every oddeven one. The system of templates for destination files is most flexible (by date, number of file, number of page, and whatever you like). Tiff Paging will merge several files into one. For example, with Tiff Paging you can combain 2 files with 10 pages in each into 1 file with 20 pages. At the same time you can resize and rotate the pages. Try it for free. You will definitely appreciate the advantages of Tiff Paging and be sorry you didn`t find it before.